Four different Ryoji Matsuoka Herring-bone Models were available: The H-500, H-600, H-800, and H-1000 as seen on page 3 of the Ryoji Matsuoka catalogue below (first two images below: Catalogue Cover and Herring-bone Model page). 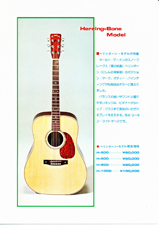 The model number corresponded to the price, so the H-500 was 50,000 Yen and the H-1000 was 100,000 Yen. The guitar I have is stamped with a serial number on the neck block which can be seen by looking into the sound hole. The serial number begins 74 on mine which I take to mean that the guitar was made in 1974. Which ties in with the catalogue which dates from around 1973/1974. The purfling around the body of the guitar has a Herring-bone pattern, the position markers are mother of pearl snowflakes, two of which adorn either side of the bridge. 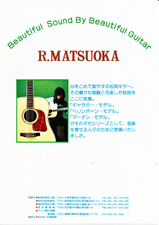 The headstock has R. Matsuoka engraved in Abalone. The top, back and sides are all solid. Unlike most Matsuoka guitars I've seen there is no label on this guitar, but the back brace is stamped with a curved Ryoji Matsuoka brand. Unfortunately the lack of label means there is no sure way to identify if the guitar is a H-500, 600, 800 or 1000. Presumably the difference in models would be due to differences in the wood used, and possibly the snowflakes markers are an upgrade over dot markers. They are beautiful guitars, the sound is tight and well balanced. The wood is stunning. The action is low and it sounds beautiful too. The only criticism I have of either of the Matsuoka flat tops I have is that they are just a little brighter than I would like. I hope to be able to temper this with string selection though. 50,000 to 100.000 Yen in the mid seventies would have been a considerable amount of money. The quality of the guitar reflects this.